Kieron Richardson is best known for his role as Ste Hay in Channel 4's popular soap, Hollyoaks. He first appeared on our screens in 2006 in spin off show, Hollyoaks: In The City, before appearing as a regular member of the cast in Hollyoaks. Having tackled some huge storylines, he took on a challenge of a different kind in 2010 when he took part in ITV's Dancing on Ice where he took 3rd place. 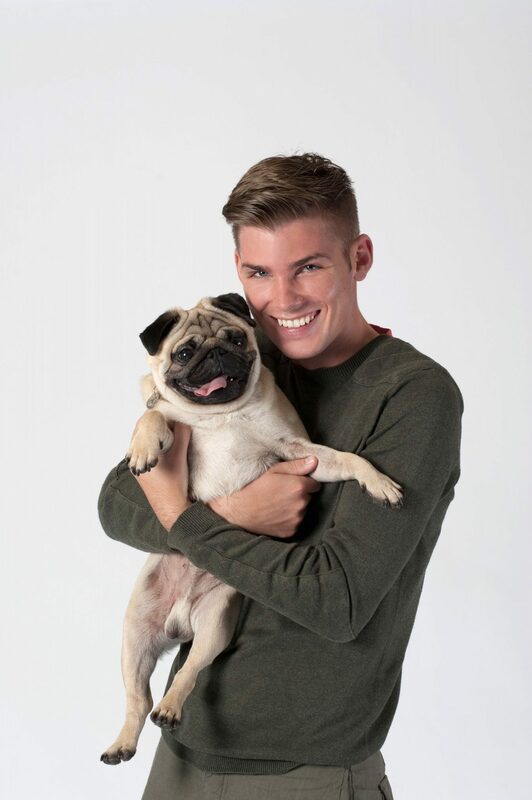 Kieron talks to Kim O'Meara about reality TV, what's coming up for Ste - and of course his love of dogs. I have two dogs, Ricky and Ronnie. Ricky was a Christmas present a few years ago and he's brilliant, he's really excitable although he's calmed down a lot lately. He's just turned three years old and you know how people always say you should go and choose the dog who chooses you, well I think I had to choose Ricky, he was the best looking puppy. Ronnie is a Pomeranian and we got her last year. She's a ball of energy, she's always doing something and she's a bit domineering really. They had a bit of an accident some months ago though, Ricky wanted her to play and I don't think he realised she was fast asleep. He disturbed her and she woke up in a shock and her tooth went in his eye so he had to have an operation recently. He's lost about 30% of vision in that eye but he's absolutely fine in himself now. I was so excited to move out and get my own dogs, growing up I had a goldfish called Geri Haliwell but that was all, no dogs, rabbits or anything, so I knew when I moved out I'd get my own dogs. You've been playing Ste Hay on our screens since 2006 in Hollyoaks, what do you love most about the character you play? I like that every year something major happens with Ste, it's been brilliant for letting me learn, develop and grow and I love it at Hollyoaks. Ste's been straight, gay, the abuser, he's been abused – everything that can happen seems to happen to him. If I could choose a storyline for him, it would be for him, Amy and the kids to go to Benidorm on a budget holiday in the Sun. The past couple of years must have been great ones reaching the final in Dancing on Ice in 2010 and with the storylines you've had on screen in Hollyoaks. Where do you hope to see yourself in 5 years time? I think I'm done with reality TV for now unless something really different came up. To be honest I don't really think that far ahead, I never plan for the future. I'm really happy at Hollyoaks, it means I can live in Manchester, see my friends and family and have my dogs around me. Do you have a motto that you live your life by? What would you say Ricky and Ronnie's motto might be? I think I'm a bit like water, I get anywhere and everywhere. Sometimes end up thinking how on earth did I get here! If I was guessing what Ricky's motto would be it'd probably be 'food, food, food'. Ronnie's would be 'make every second count', she's always so excited, she has no cares in the world and she's very energetic. I sometimes look at her and wish I was a bit like that. If you were to swap roles with Ricky or Ronnie for a day, how do you think they'd cope being you and what would you most love about being them? Well, out of Ricky or Ronnie, I'd swap roles with Ricky. And finally, this is always a tough question and often requires a fair degree of thinking time but….If Ricky and Ronnie had the ability to speak and answer one question and one question only, what would you ask them and what do you think that they would say? I'd ask them 'am I a good dog owner?' and I'd hope they'd say yes!